I finally finished this "carnation" while visiting fellow tatter Majolika in Munich, and I was also admiring her beautiful blackwork. I have also uploaded my work in progress...but I think I can see where I've been going wrong. 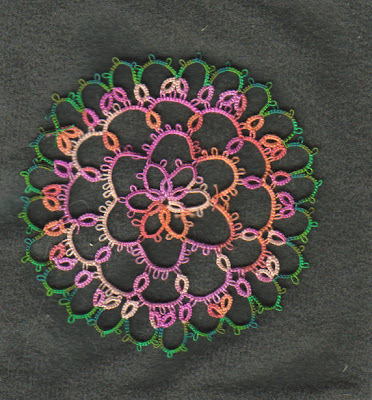 The tatting pattern is from a back no. of the Ring of Tatters newsletter, by Hannah Crowle. Just found your blog and enjoyed looking at all your tatting. Your motif is very pretty. I like the colors you used. Especially the varigated green. 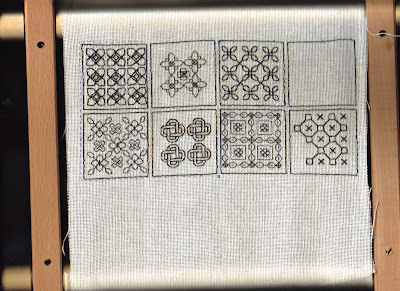 It has been years since I've seen or done any blackwork. Is this your friend's project? Actually this is my blackwork, my friend's work is far superior! I'm sorry if this comment is late, I have been away for a few days.